Light therapy is greatly associated with Seasonal Affective Disorder but it can actually help with so much more. Since light therapy helps give us energy, it is actually the perfect way to help you sleep better. 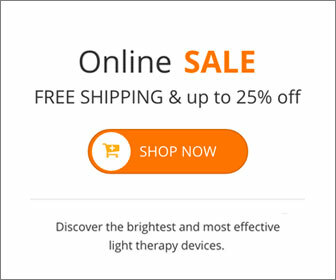 Whether you are someone that tends to sleep too much or someone that can never seem to get a full nights sleep because of sleep interruption, using light therapy can help set your body straight. When getting your light therapy, you will want to get into a pattern and use the light around the same time every day. Using the light for only 30 minutes each morning can help reset your circadian rhythm (your body’s internal clock). When you use light box therapy for sleep, it releases serotonin in your brain. Serotonin, also known as “The Happy Chemical”, is what give you energy and boosts your mood. Using the light for a mere 30 minutes can give you enough energy to keep you awake during the day. In turn, your body recognizes that it has been releasing serotonin all day and it instinctively starts to produce melatonin which is what makes you sleepy. Once your body gets used to the new cycle with this treatment for sleep disorders, you should be enjoying a great nights sleep while still staying awake all day! This entry was posted on Tuesday, August 8th, 2017 at 10:20 am	and is filed under Light Therapy, Uncategorized. You can follow any responses to this entry through the RSS 2.0 feed.